Advanced heart failure leads to dysfunction across most organs systems which produce significant impairments in quality of life and functional capacity. While heart transplant remains the gold standard of care, left ventricular assist devices (LVAD) have emerged from their role as bridge therapy to destination therapy for an increasing number of patients. Therefore, a thorough examination of the types of devices and their benefits and limitations are necessary to understand the interaction between the remaining pathophysiology and additional treatment modalities. The purpose of this activity is to provide the learner with the basic knowledge required to understand the prevalence, complications and current therapeutic strategies to manage patients with heart failure. 1. Brief review of heart failure causes, signs/symptoms 2. Advanced symptoms and failure often require heart transplant 3. Increasing need for LVAD bridge and destination therapy 1. Pulsatile versus continuous flow LVAD 2. 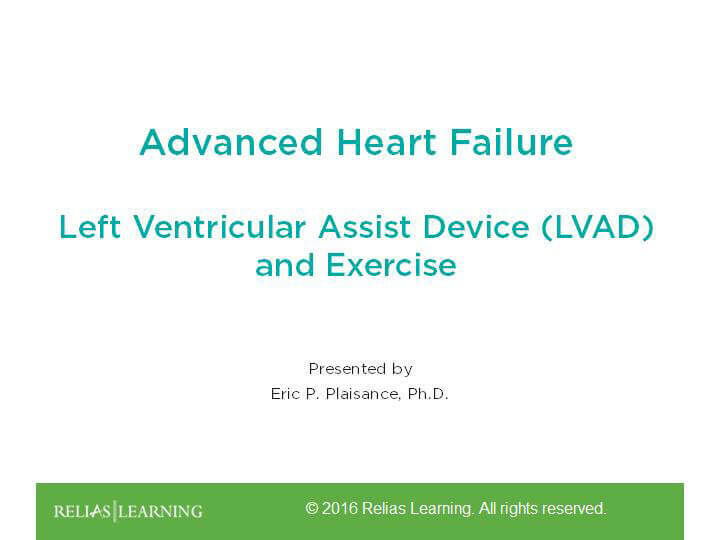 Examination of how LVAD devices are implanted and function 1. Significant improvement in quality of life and functional capacity 2. Examination of known capacity for improvement 3. Skeletal muscle dysfunction often remains along with limited cardiorespiratory capacity 1. Goals of exercise therapy 2. Types of exercise used 3. Could resistance exercise training attenuate skeletal muscle dysfunction and improve cardiorespiratory fitness in patients with LVAD – Examination of evidence. Dr. Eric P. Plaisance is currently Assistant Professor of Exercise Physiology at a top tier research intensive (R1) medical university. He has over 18 years of experience in the fields of cardiovascular and exercise physiology as a researcher, instructor and clinical exercise physiologist. Eric completed degree requirements for the Doctor of Philosophy in the Department of Kinesiology at Auburn University in 2006. He subsequently completed fellowship training at two biomedical research institutions. In his current position, Dr. Plaisance works extensively with his institution’s Advanced Heart Failure, Heart Transplant, Mechanical Circulatory Support and Pulmonary Hypertension Unit where he conducts research designed to explore the role of aerobic and resistance exercise on improvements in functional capacity and quality of life among patients with heart failure and left ventricular assist devices (LVAD). Eric has authored or co-authored over 70 publications including articles for peer-reviewed professional journals, book chapters and abstracted publications. His professional affiliations include the American Association of Cardiovascular and Pulmonary Rehabilitation (AACVPR) where he serves as a member of the research committee, American College of Sports Medicine (ACSM). Disclosure: Eric Plaisance, PhD, ACSM Exercises Specialist has declared that no conflict of interest, Relevant Financial Relationship or Relevant Non-Financial Relationship exists. The target audience for this course is: intermediate and advanced level Physical Therapists; intermediate level Dietitians; intermediate level Nurses; intermediate level Occupational Therapists; in the following settings: Rehabilitation Settings.